UNIVERSITY PARK, Pa. — The U.S. Department of Energy Vehicle Technologies Office has awarded Donghai Wang, associate professor of mechanical engineering at Penn State, a $1.1 million grant to develop a new lithium-ion conductor for the protection of lithium metal used in next-generation battery technologies for electric vehicles. 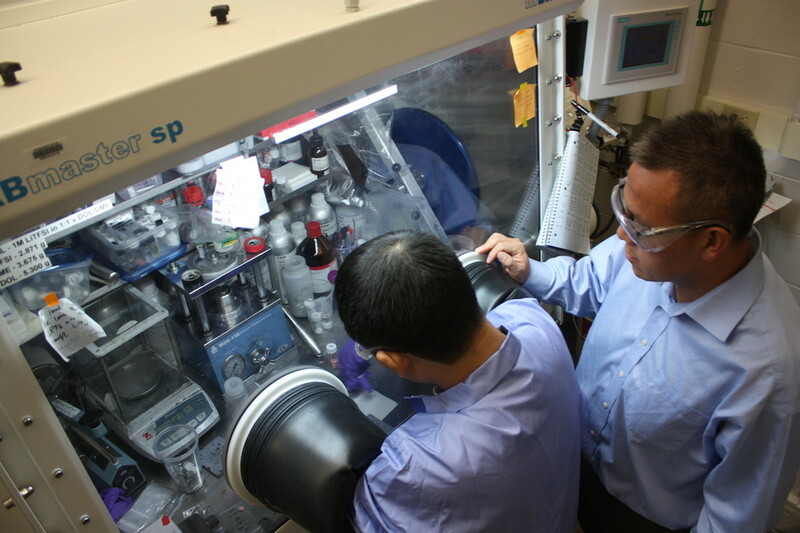 Wang leads the Energy Nanostructure Laboratory, which focuses on nanomaterial development for clean energy technologies, such as batteries, solar cells, fuel cells and environmental remediation. ‘Nano’ refers to objects, devices and materials that are very small, even smaller than microscopic. In real terms, a nanometer is one billionth of a meter wide. With the new funding, Wang and his team will use very thin layers of material called nanostructured hybrids to solve a well-known problem associated with lithium metal batteries, and ultimately build a better battery. The batteries that typically power electric vehicles consist of a cathode, or positive side, and an anode, or negative side, separated by a liquid electrolyte. Batteries with lithium anodes are more powerful than standard lithium batteries and therefore can do more in a smaller, lighter package. One challenge for a battery with a lithium anode is that as it charges and discharges, tiny pieces of lithium, called dendrites, form and grow across the electrolyte, eventually bridging the positive and negative sides of the battery and causing a short-circuit, which can overheat and cause a fire. Wang’s research will seek to develop a protective coating of very thin, self‐formed hybrid conducting layers for lithium anodes that will prevent the formation of dendrites by separating the anode from the electrolyte. Once the protective layer is in place over the anode, Wang believes he can create a safer, lighter, more powerful, more efficient electrical vehicle battery. He will then test his new battery and compare its performance with that of a current-generation electric vehicle battery. “Our group is very excited to have received this award and to work on this critical and challenging advancement to improve the performance of lithium batteries,” he said. The total amount of Wang’s award is $1,139,319. His project was one of 35 chosen for funding in 2016 by the Vehicle Technologies Office. All of the projects funded aim to reduce the cost and improve the efficiency of plug-in electric, alternative fuel, and conventional vehicles and most will support the goals of EV Everywhere, an effort to make plug-in electric vehicles as affordable and convenient as gas-powered vehicles by 2022.